Woodlands Manor Farm self catering cottages in Bude are a little bit of luxury in North Devon. Comfortably, Woodlands Manor Farm holiday cottage sleeps 10, with swimming pool, games room, sitting room with TV and wood burner it’s the ideal retreat for your family. The holiday cottages in Bude benefit from a private garden, they provide welcoming and spacious accommodation for guests. These family holiday cottages in North Cornwall have excellent reviews from Tripadvisor and Boltholes. Booking family holidays in Cornwall with pool & games room on site couldn’t be easier, just call Woodlands Manor Farm and cottage holidays in Bude on 01288 331689. If you are looking for luxury holiday cottages in Bude to take the family to then look no further! 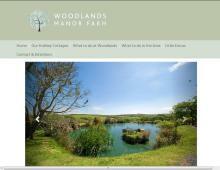 Woodlands Manor Farm offers great child friendly holidays in Cornwall. Book your break today with Woodlands Manor Farm – and enjoy your fantastic holiday cottage with pool in Bude.